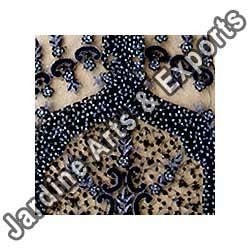 Shining black beaded silk embroidery have been interestingly used to create a pattern that is sure to captivate you. Fine quality thread is used on tulle to give life to some of the most exquisite designs. The overall look of the design is tantalizing and is gorgeous, as the design is heavy and unique. The silk thread has been finely woven in the shape of small flowers that spreads across the gown. Looking for Evening Wear Embroidery ?